"National Discourse," artist unknown but possibly James Gillray, 1780, National Portrait Gallery. Beside the outwardly hostile expression, our Jack also wears a round hat with an upturned short brim, decorated with a blue bow on the left side. The bow, which has made appearances in other pieces (especially those by Carington Bowles) may have been a common feature on the shore going clothes of tars in the late 1770s and into the 1780s, but we'll have to examine some more illustrations before we say anything definitive about that. His hair notably short, even more so than most portrayals of sailors. The neckcloth hides his collar, and is of a yellow and red plaid fabric. His short jacket appears to be without a collar (though it's difficult to tell beneath his neckcloth). We can say for certain it has no waist pockets, ends at the waist, and has slash cuffs that are buttoned. Both the cuffs and his front, which is double breasted, are held by yellow metal buttons. 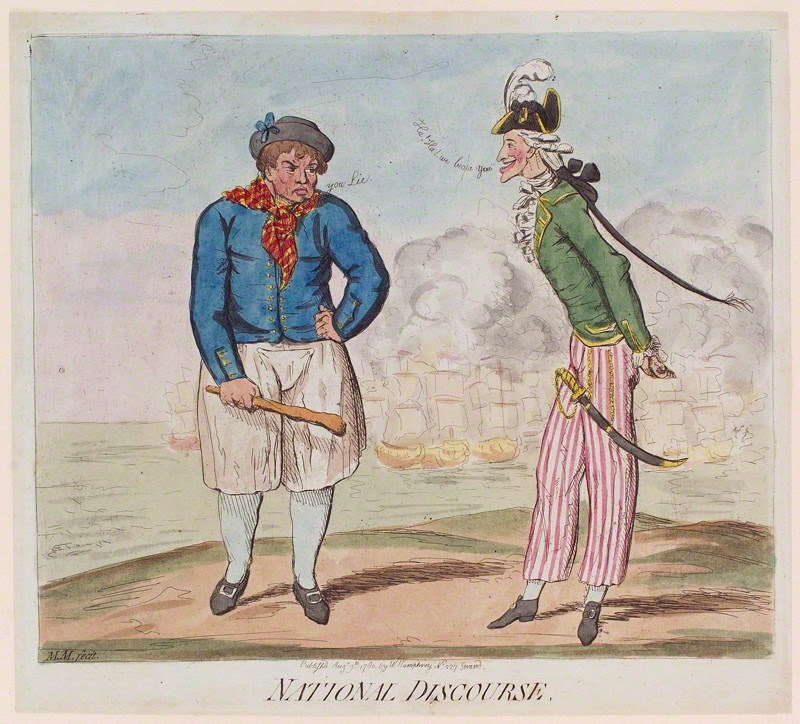 Gillray seems to have changed his mind about what kind of cuffs the sailor would have, as one side is cut differently than the other. His slops are an off-white with a broad fall, held by what appears to be cloth covered buttons. They are very wide, and end below the knee. His stockings are a white or very light blue, ending at pointed toed shoes with rectangular white metal buttons.